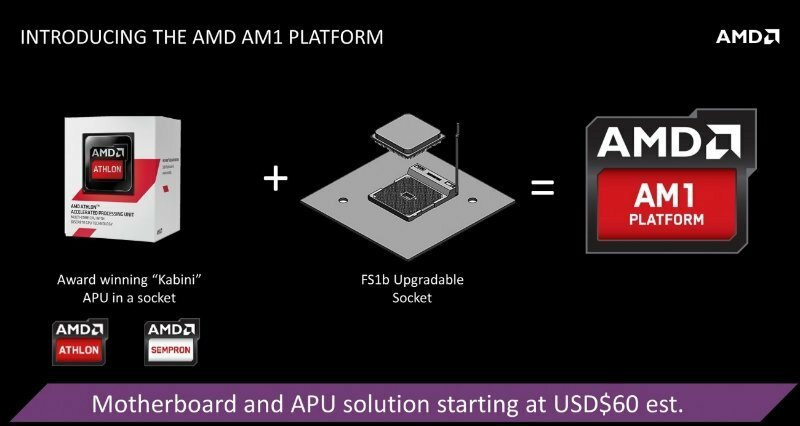 With an aim to dominate the desktop in emerging markets, chipmaker AMD has announced the AM1, a new low-cost SoC. It's effectively a sibling of the Kabini family of chips, that were launched last year with both dual- and quad-core CPUs and GPUs on the same chipset -- very similar to what just landed on both the PlayStation 4 and Xbox One. While Kabini was destined primarily for portables, AM1 is designed to take on desktops. The company is offering the chipset and motherboard combo at an estimated starting price of $60. While the price seems quite reasonable, the chipset has some restrictions. According to ArsTechnica, motherboard manufacturers ASRock and Gigabyte say that AM1 will be limited to a 25W maximum power draw from the chipset, along with a PCIe 2.0 restriction. The company hasn't yet formally announced specs for the AM1. AMD says that the new chipset is better than Intel's Bay Trail platform, as it has higher memory speeds, 16 GB memory support, an upgradable socket, and Windows XP support. With emerging markets witnessing a decline in PC sales due to an increase in adoption of smartphones and tablets, it would be interesting to see how well the AM1 is received. The new chipset is set for launch on April 9.